‘The League of Gentlemen’ (1960) is a magnificent crime caper film, liberally sprinkled with familiar film faces. Jack Hawkins, Richard Attenborough and Bryan Forbes are just three of those faces. And of course if there’s Bryan, Nanette Newman is often found in the vicinity. And there she is, in the bath, being cheeky. Clearly this film has something for everyone. The plot involves a former army top brass type (Hawkins) bringing together a motley collection of former soldiers. Each served in World War Two and has something shady to hide from these times. None of them have settled into a respectable post war life either. Hawkins has researched each man carefully over a long period of time, and has allocated each of them a role in a perfectly planned bank robbery. Both the promise of an equal share in a large sum of cash, along with the fact that they each have nothing to lose, means that they all accept the job. Hawkins moves the men into his rambling old country house where they settle into an army-like existence as they plan, construct and rehearse. They are all only too pleased (despite minor grumbles about potato peeling and room sharing) to return to the old life. At last, after years of drifting, they have some form to their lives and a goal in sight. At first glance, this barracks style set up could be for comedy effect – grown men playing at being in the army like a bunch of kids let loose in an old disused base camp. But, there is a serious bit of social history behind this. While watching, I got the firm impression that this structure to their lives had been a serious psychological hurdle in its absence. They were all lost in a futile search for something that was unobtainable in peacetime. I began to wonder if this had been a common or recognised problem in the two or three decades following the war. It wasn’t really something that had occurred to me as both of my Grandads had returned from their war service to settle into steady jobs. But, on giving it more thought, there will have been those whose wartime experience was so intense that a return to normality was difficult to deal with. Three dapper post war gents. 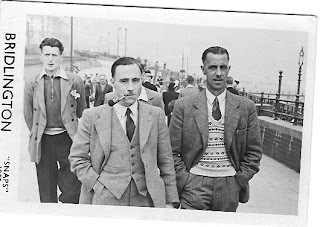 The one with the pipe is Grandad. One entry relates the story of a man so unable to cope with life in Civvy Street that he pretended to be a wanted man in order to secure himself a spell in prison. That many returning soldiers faced these problems is obvious when you think about it. But it took Mr Hawkins’ exploits to make me think about it. Film really can open your eyes to history.